China hasn’t been the only nation to modify the eating habits of the Thai people; both India and Portugal have played an important role. 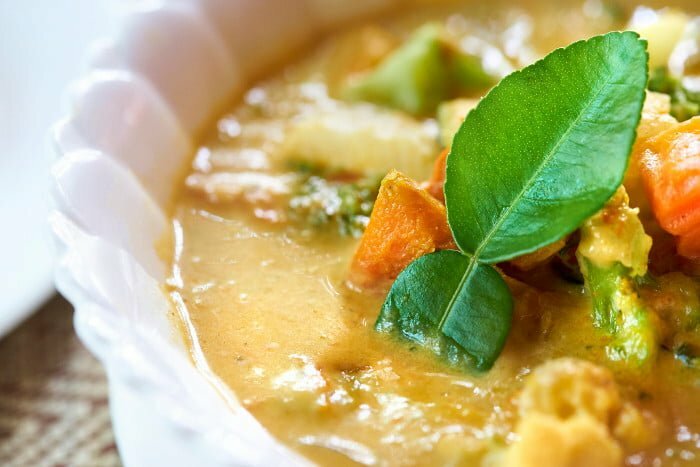 For example, Thai curry is a modified and adapted version of typical Indian curry, where the clarifying butter is substituted by coconut oil. The spicy pepper, present in the majority of Thai dishes, was imported by Portuguese monks. Something particular that you’ll notice during your visit to Thailand, is that there’s always the chance to eat anywhere. There’s a truly wide choice of places for tasting the local food; from “mobile” restaurants (which are anything but makeshift! ), who serve typical dishes at rock-bottom prices, to traditional restaurants where the prices are slightly higher, but you’ll have a little more comfort (such as air conditioning, for example), up to more expensive places, such as in a skyscraper or along the Chao Praya River, where you can watch the sun go down behind the Wat Arun Temple. As was already suggested, the Thai people love to eat, and they do so in every place and at all hours. It’s for just this reason that the majority of street food is not only already ready, but also prepared in such a way that you can eat it anywhere without the use of a knife. Even the drinks are sold in plastic bags with a straw included. The dishes that I chose to present in this article are the most well-known. Each has different variations depending on the region where it’s being prepared. In the northeastern part of the country called Isaan, for example, eggplants and at times even fermented crab are added to the typical papaya salad. Thai food is distinguished from Western cuisine in lots of ways, such as breakfast and the way of eating at the table. If in Europe we eat bread and marmalade or cereal and milk, in Thailand (and Southeast Asian in general) this meal mainly contains rice accompanied by meat, fish or eggs. One of the most popular breakfast dishes is Khao Khai Chiao (in Thai: ข้าวไข่เจียวทรงเครื่อง), prepared with white rice which is a frittata. The food, whether at home or in a restaurant, is placed at the middle of the table, so that everyone can have a portion. This too is a characteristic derived from Chinese customs. A balanced Thai menu always includes a salad as an antipasto. 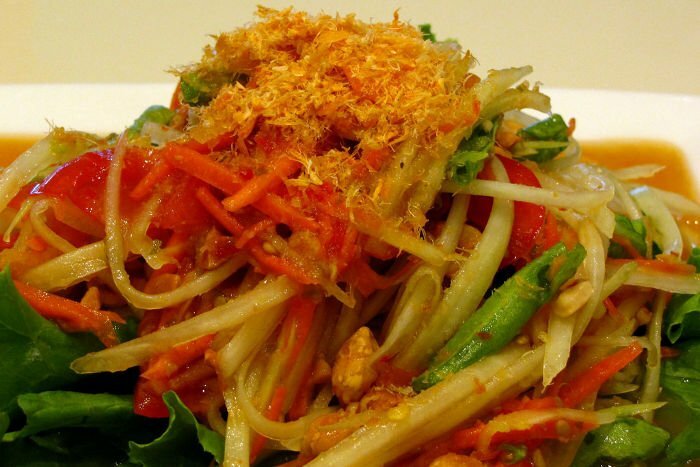 Among the most famous salads from the Kingdom of Siam, we find papaya salad (in Thai Som Tam). Despite being known as a typical Thai dish, papaya salad owes its origins to the northeastern region of the country and western Laos. Papaya salad, unlike typical western salads, is a spicy salad. The Thai saying “mai pet, mai roi” (if it isn’t spicy it isn’t good) has never been truer than when speaking of papaya salad. If you don’t like spicy food or can’t eat it, at restaurants or street vendors you can ask them to put less pepper or avoid it altogether, so you could have a less spicy salad. Nevertheless the papaya salad will have a less balanced taste, and therefore will be less tasty. The main ingredients are the following: green papaya and julienne carrots, raw long green beans, small tomatoes, chili peppers and roasted nuts. As for the sauce, fish are mainly used even though many restaurants offer a soy variant. They also add palm sugar, garlic and lime. To prepare Som Tam you need a mortar to crush the garlic, chili peppers, papaya and carrots for a few minutes. When the papaya becomes soft, you can add beans and tomatoes, followed by fish sauce, the sugar and the lime. The final touch is the roasted nuts, which are added to the finished dish without going through the mortar. 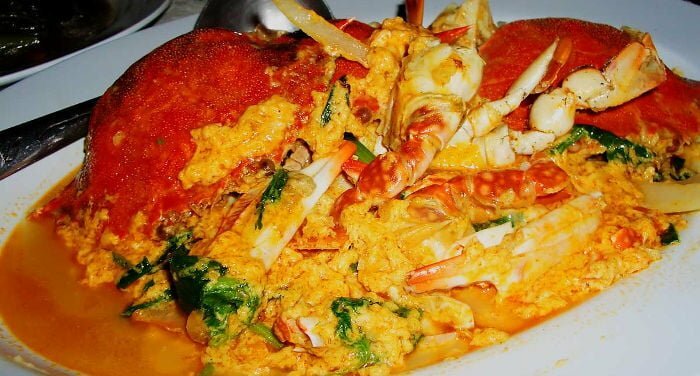 As a typical Thai dish, it’s found on practically all restaurant or street vendors’ menus. Som Tam exists in lots of versions: with dried shrimp, with olives, with eggplant, with hard-boiled eggs, with seafood or with crabs. The best places to eat Som Tam in Bangkok are located in the area around Victory Monument. At sunset, along Rangnam Road, the restaurants open their shutters and street vendors set up seats and tables along the sidewalks. If you walk the entire road on foot, you’ll have an abundance of choice. Prices start at 30 THB. Papaya salad is a dish that can also be eaten by those who follow a vegetarian diet; it is however important to notify the cook to not use fish sauce, which is something the Thais put on everything, and opt for the soy or mushroom sauce. The fish sauce is prepared by pressing raw, dried fish such as anchovies, seafood or calamari. The Thai people consider soup as an integral part of a balanced menu. The most famous soup is Yom Tum. It can be prepared with chicken, pork or shrimp. It’s particular flavor is due to the combination of lime juice and chili pepper. The origin of this dish goes back to the ancient Kingdom of Siam, between the end of the 1700’s and the beginning of the 1900’s. Making Tom Yum is rather simple: you start by boiling the broth with galanga, lemongrass, leaves of kaffir lime and coriander root. At this point, depending on how you like the soup, you can add mushrooms, fish or meat, fish sauce, sugar and chili paste. Once cooked, add the lime juice and coriander. Chili paste is widely used for cooking soups like Tom Yum and Tom Kha. To prepare this paste use two spoons of finely sliced carrots, two spoons of garlic and two white onions. Lime juice, tamarind, two spoons of dark sugar, oil, soy and obviously two spicy chilis are added. 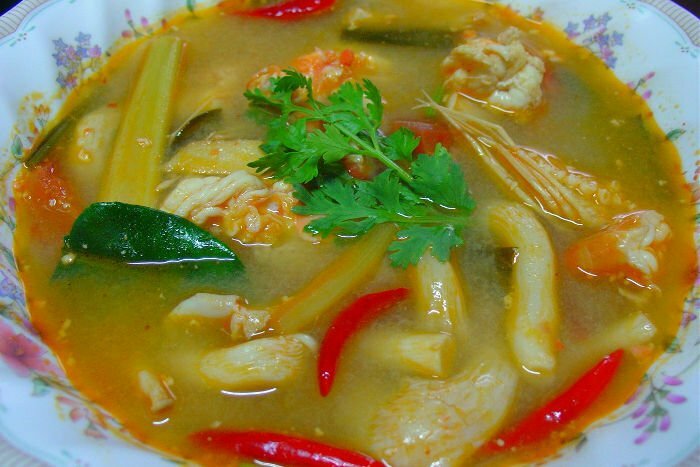 As with papaya salad, Tom Yum Soup is extremely common, both in Bangkok and in the rest of Thailand. Pad Thai is perhaps the most famous Thai specialty in the world. 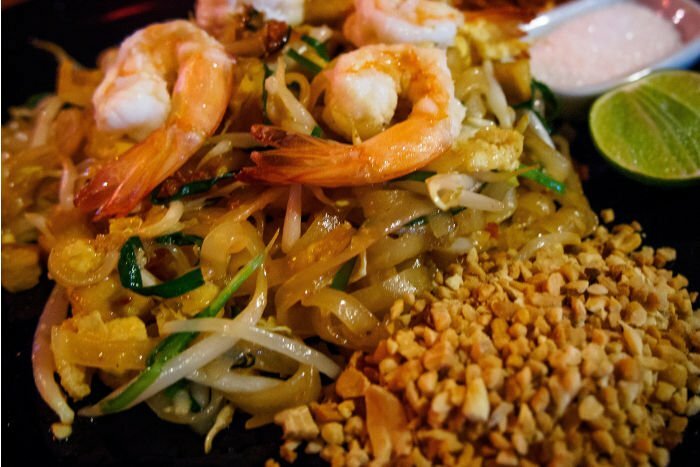 Created a little more than 70 years ago, Pad Thai was a dish created ad hoc during a culinary contest organized by the king. The purpose of the competition was to invent a dish that could represent Thailand abroad. Pad Thai, together with papaya salad, is one of the most easy dishes to find in restaurants. However unlike papaya salad, it doesn’t have many variations; in fact it’s cooked pretty much the same way throughout the country. The main ingredients are flat rice noodles (fettuccine style, just to be clear), egg, nuts, vegetables, fish or meat, garlic, chili pepper, palm sugar, lime, and fish sauce. For the vegetarian version they add tofu. Pad Thai can be cooked in a wok, as well as a nonstick frying pan. The first thing to do is to soak the rice noodles so as to soften them and make them easier to cook. In the meantime warm the oil to medium temperature and stir-fry the onion, shrimp and tofu. At this point add the noodles, fish sauce, sugar and a little water. The noodles need to be cooked for 2-3 minutes, to the point that they’re no longer “sticky”. After that move it along one side of the pan, while cooking the egg on the other side before mixing it in with all the rest. In the end add the chives and soy sprouts. The dish is served with a lime quarter, the previously crushed nuts and chili powder. The most famous restaurant in Bangkok to eat Pad Thai is called Thip Samai. This spot is found near the Golden Mountain, a Buddhist temple located on the famous backpacker street, Khao San Road. Considered as the best restaurant in Bangkok serving Pad Thai, each evening in front of Thip Samai you’ll find a very long line of people waiting for a table. The wait time is usually between 20-30 minutes. Pad Thai at Thip Samai is served 3 different ways: with meat, fish, or vegetarian. It’s particularity is that all the ingredients, including the noodles, are served inside an omelet of reduced thickness. Even the preparation is a show in and of itself: cooks prepare Pad Thai right then and there, dedicating a little more than a minute per dish, and performing acrobatics admired by both tourists and locals. 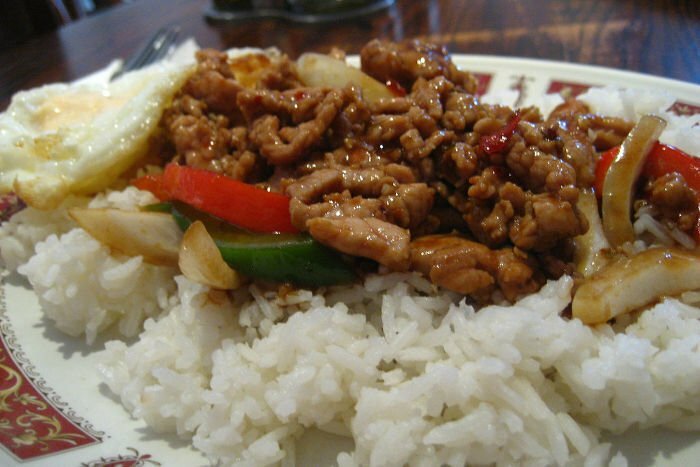 Among all the dishes accompanied by white rice, Pad Kra Pao Moo Sap is one of the most preferred in Thailand. The ingredient that marks it from all other dishes is the tulsi (also called holy basil), a plant originally from India. Thanks to its simplicity, Pad Kra Pao Moo Sap can also be found pretty much everywhere, both in restaurants and as street food. First of all you must fry an egg in boiling oil; it’s important that they egg be added after the oil is already boiling, so that it doesn’t crumble. After this you prepare a sauce with garlic and chili pepper that have been ground in a mortar. When the sauce is ready you cook the chicken or shredded pork, adding the tulsi and fish sauce. The dish is served with a side of white rice, and with the fried egg on top. A restaurant where you can eat a very special version of Pad Kra Pao Moo Sap is Soul Food Mahanakorn, in Thonglor. In fact, they use the meat of Australian lamb instead of chicken or pork. You can’t say that you’ve been to Thailand if you haven’t tried one of the many versions of curry. Its origins go back to the colonial era in India, where it’s used to indicate dishes seasoned with a mix of spices. Unlike India, where to prepare curry they grind dried ingredients, in Thailand the curry is served in a paste form, obtained thanks to the use of fresh ingredients such as chili peppers, onion, ginger, lemongrass, coriander, coconut milk, shrimp paste, scallions, lime, galang and green pepper. If you visit markets like Jatujak, or shop in local supermarkets, you’ll have a very colorful variety of curry pastes ready to be used. The most famous curries are the green, yellow and red; the green is the spiciest. The green curry is mainly used for cooking soups, such as Green Thai Curry, served with chicken meat. The red version is prepared with a shrimp paste base and red chilis. It’s often used in making dishes such as Massaman soup. Yellow curry is prepared with a red curry base, to which turmeric is added. Another type of curry frequently used as a sauce is that of peanuts, called Penang. Originally from Malaysia, this paste has a brownish color and goes well with meat and vegetables. Its flavor is sweet but spicy. One of the most famous desserts is Mango sticky rice, a dish prepared with rice and mango. The recipe (for two people) is quick and easy: boil 150 ml of coconut milk, after which add two spoons of sugar and a dash of salt. Once warm, pour half of it into a bowl. Cook a cup of sticky Thai rice together with the other half of the mixture until the coconut milk is completely absorbed. To finish, add two slices of mango on top and the mixture of the rice that was just cooked. Pancakes and jell-o are considered authentic street food, and for this reason my advice is to for trying the best local sweets, is to go to the markets, like Jatujak or night markets. The most well known type of pancake is called Khanom Thuntag. They are rice crepes folded in two like tacos and stuffed with cream of coconut and palm sugar. The most popular is with Foi Thong (egg yolk mixed with sugar). The Thais are crazy for jell-o. You can find them in all shapes and colors, and their peculiarity is in the fact that they are cooked al dente so as to keep their consistency and therefore the strangest shapes. Another very important part of the Thai menu is the fruit. 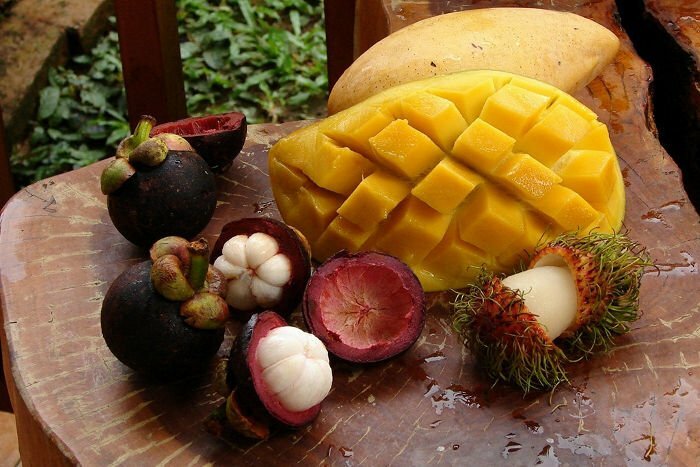 In Thailand you can find lots of varieties of tropical fruit, from mangosteen to durian. You can buy fresh fruit practically anywhere; most times they’re already washed, cut and placed in little bags, ready to be tasted. They cost between 10 and 30 THB a bag; with unripe mango and guava to which a mixture of sugar and chili powder dust is added. If you’re a vegetarian or vegan you might have difficulty finding dishes that don’t include animal ingredients, especially when it comes to fish sauce which is put on practically everything. However the situation, especially in Bangkok and Chiang Mai, is slowly evolving and there’s a growing number of more and more restaurants dedicated to vegetarians. In Thailand, to order vegan dishes in a restaurant, a useful expression is “gin jay”, written as กินเจ, which means vegan food. You can also use the phrase “ben mang sa wirat” (เป็นมังสวิรัต): I’m a vegetarian. Here are two vegetarian places in Bangkok with lots of options: May Kaidee, on Khao San Road, and Ethos (also located on Khao San Road). The first serves Thai dishes such as Papaya salad, Pad thai, various types of curry and typical desserts such as Mango sticky rice; the second instead also serves international specialties such as lasagne and hummus with falafel. If you want to eat a vegan version of good street food, as soon as you get out of the Ari BTS stop, on the left side coming from Victory Monument, on a little street before the glass skyscraper of Gunkul Engineering Company, from Monday to Friday you’ll find small stalls that sell vegan versions of typical Thai dishes. If you want to immerse yourself in traditional Thai cooking tradition, in Bangkok you’ll have an abundance of choice when it comes to cooking courses. There are options for all tastes and budgets; from courses a few hours long, to private ones, to lessons where you can learn to “carve” fruit. Prices start from 1,000 THB for a course of a few hours, up to 15,000 THB for a 10 day course. Among the most famous schools we find Bangkok Thai Cooking School which also offers rides from the BTS stop to the school, Chef Leez Thai Cooking Class and Sompong Thai Cooking School (one of the cheapest). Some schools also offer the opportunity to go to the market and do the shopping together, so you can personally see where to find and how to choose the ingredients. After buying the ingredients, you return to the school to cook them; lastly everyone eats the dish that they’ve prepared. There are also schools that offer courses for vegetarians and vegans, such as the restaurant May Kadee on Tanao Road. In this case the school is located on the second floor of the restaurant of the same name, and the lessons are taught directly by the owner, Mrs. May. The only drawback is that you can’t participate in shopping at the market: the ingredients are bought, washed and cut by the restaurant’s staff. Before starting to cook you’ll sing together a Thai song called the Sap Cooking Song. All the recipes, there in a little book that’s given to each student at the beginning of the course, contains strictly vegetable ingredients. The famous fish sauce for example, is substituted by one made of mushrooms. This school is also available in Chiang Mai, a city in the Si Sa Ket region, from which Mrs. May comes from. Rich in proteins and vitamins, insects are considered an integral part of Thai cuisine. If in the past they were mainly eaten by the poorest classes because they’re very cheap, today they’re appreciated also by the high society and by tourists. In Bangkok you can find insects for sale at street stalls and in the markets. The most famous places to find them are Soi Rangnam, nearby to the Victory Monument shopping center, Khao San Road, Jatujak Market and also Ratchadapisek. As with the fruit, insects too are sold in little bags. The cost is between 10 and 50 THB. 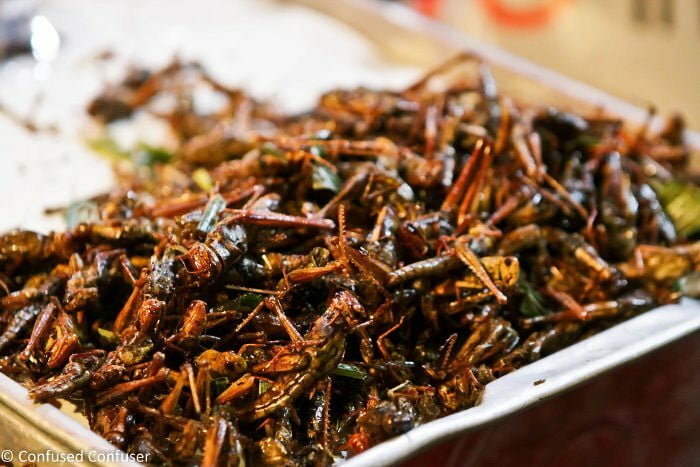 Grasshoppers, ants, scorpions, crickets, silkworms, caterpillars and beetles are fried and served with sauces and spices of every sort.